Walter Mosley's talent knows no bounds. 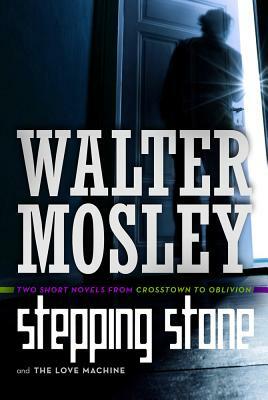 "Stepping Stone" and "Love Machine "are but two of six fragments in the "Crosstown to Oblivion" short novels in which Mosley entertainingly explores life's cosmic questions. From life's meaning to the nature of good and evil, these tales take us on speculative journeys beyond the reality we have come to know. In each tale someone in our world today is given insight into these long pondered mysteries. But how would the world really receive the answers? Truman Pope has spent his whole life watching the world go by--and waiting for something he can't quite put into words. A gentle, unassuming soul, he has worked in the mailroom of a large corporation for decades without making waves, until the day he spots a mysterious woman in yellow. A woman nobody else can see. Soon Truman's quiet life begins to turn upside-down. An old lover surfaces from his past even as he finds his job in jeopardy. Strange visions haunt his days and nights, until he begins to doubt his sanity. Is he losing his mind, or is he on the brink of a startling revelation that will change his life forever--and transform the nature of humanity? The Datascriber was supposed to merely allow individuals to share sensory experiences via a neurological link, but its true potential is even more revolutionary. The brainchild of an eccentric, possibly deranged scientist, the "Love Machine" can merge individual psyches and memories into a collective Co-Mind that transcends race, gender, species . . . and even death itself. Tricked into joining the Co-Mind, as part of a master plan to take over the world, Lois Kim struggles to adapt to her new reality and abilities. Is there any way back to the life that was stolen from her, or is she destined to lead humanity into a strange new era, despite the opposition of forces both human and otherwise? WALTER MOSLEY is one of the most versatile and admired writers in America today. He is the author of more than thirty-four critically acclaimed books, including the major bestselling mystery series featuring Easy Rawlins. His work has been translated into twenty-one languages and includes literary fiction, science fiction, political monographs, and a young adult novel. His short fiction has been widely published, and his nonfiction has appeared in The New York Times Magazine and The Nation. He is the winner of numerous awards, including an O. Henry Award, a Grammy, and PEN America's Lifetime Achievement Award. He lives in New York City.